I was asleep. I rolled over and looked at the clock. It was a little past 2:30 in the morning. My mother was a nurse and worked graveyard shift. She was calling me from work, the hospital. I got out of bed and went to the kitchen phone, trying to wake up. Susan was my best friend Lynn’s mother. Susan had left Lynn’s father Rob a few days before, because of his rampant alcoholism. “No. I don’t have their number. Why, why do you want their number. And why are you calling me now,” I insisted. My mother didn’t hesitate, never considered the consequences of what she then said. My best friend’s world had changed forever, and I knew it in that moment. Like the way I knew the world changed when I saw American aircraft dropping bombs on Baghdad. The morning that I watched shock and awe on CNN, I knew that world had changed forever, and that there was no going back. Something permanent and palpable had taken place, and the world was different. I had the same feeling when I received my mother’s morning phone call, my junior year of high school. I knew that Lynn’s world had changed, that nothing would ever be the same, and there was no way to go back. I didn’t understand what that meant, I simply knew that something had irreparably exploded, that everything was now different, none of it for the good. My mother’s call was a psychic gunshot, leaving me numb and dumb. There was another layer of devastation in this information, because I knew that Lynn’s world had imploded before she knew it. At fifteen or sixteen, there was a God-like knowing that had been unwittingly bestowed on me, because I knew that something horrific was about to visit my closest friend, one of the kindest, most generous souls that I have ever known, someone who would give you the shirt-off-her-back if you needed it, someone who didn’t play games like so many in our small high school did, and someone who never spoke with malice about another person. She was kind and fun and smart and cool. I loved her, trusted her, and envied her in the way the best friends often do, thinking her the better of us. We never once quarreled, never bickered, and we both avoided the catty, shallow people who overpopulated our school and town. My mother’s call was like watching a movie in which you know from the set-up that a guileless protagonist is going to suffer a terrible fate, and there’s nothing to do to stop the tragedy. Only this was life, it was real, and the violence and destruction would irrevocably change her life, the whole of it. In that moment of knowing, my life changed as well. Lynn’s dad didn’t die. The gunshot managed to blow the cognitive part of his brain out, while leaving the parts that kept him a shell of a human. When I write, “blow the cognitive part of his brain out,” I am not being metaphorical. He lived for ten or so years with a large chunk of his head missing, a deep hollow in his skull existed where Rob once lived. He stayed in a long-term care facility, until his death. The family rarely visited him. I think it was too difficult. Susan had lived for years with his alcoholism, and now there was this. I think, though I don’t know, she decided to salvage the pieces of her life, with as little guilt as possible, which probably took a long time. Lynn and her sisters couldn’t bear seeing their father wasting in a nursing home, seeing the man they loved existing as he did. He had been a gentle and generous man, a caring father, not abusive or violent, by all accounts and evidence. His drunken sin was melancholy, not violence. He was a sympathetic person for whom the excesses of self-medication had long ago quit working, and whose psychic demons got the best of him. I didn’t tell her that I suspected she was correct. No, I never said that her father might be buried in there somewhere, happy to hear his oldest daughter’s voice, after so long alone in that bed. I wouldn’t give her a hint that some consciousness might stay in that shell of a body, forced to live knowing, in some way, what he had done to himself, and his family. I don’t know, and no one ever will. But I know that science is learning that a part of us often remains intact when the doctors pronounce that our minds have checked out, declare us brain dead. It’s emerging science, but its persuasive and resonates with the wild imaginings that many experience when they believe that, “there is somebody in there.” Until science catches up and gives us a new story, empirical research trumps experience. But I trust Lynn’s perception, and I believe that Rob’s heart or mind, something deep and residual, related to consciousness, jumped when she said, “Hi, Dad, it’s Lynn,” and took his hand in hers for a few minutes. I wouldn’t tell her that. I said, “maybe he did, and if he did, I’m sure it made him feel better.” I then listened and understood when she told me that she couldn’t visit him again, for a while. When I write that “my life changed forever” because of Rob’s failed suicide attempt, I am not, again, being metaphorical. For the only thing that stopped me from killing myself for over a decade was the phantom that Lynn relayed of her father in that bed, after failing to kill himself. When Lynn described the scene of her visit, my mind created an image of Rob in that bed, part of his skull missing, which I elaborated and built on as time went on. One summer I worked in a convalescent hospital, and all the sights and smells and sounds of the half-dead and dying allowed me to add details to a picture that was already horrific. In my imagination, I saw Rob being turned, saw the oozing red bed sores, imagined the daily diaper changing, smelled those smells that long-term facilities fill your nose with, smells that rot memory’s fragrance of innocence. All the sorry particulars about what kept him going, I filled in with excruciating detail. I imagined that he was living out every day alone, in that shell, suffering a fate worse than the one that he had tried to escape. I conflated the story of Dalton Trumbo’s “Johnny Got His Gun,” with Rob’s nursing home existence. Although Rob was brain-dead, because of Lynn’s description, and the flicker of life that she thought she saw, I imagined him trapped in a body, with enough memories remaining to plague him, a person with enough brain left to know that he needed changing and turning. I imagined him waiting for years on end for a visit, a timeless steam of days, endless and empty. I developed this prolific embellishment from Lynn’s relatively brief story. But if I excessively ornamented her story, it’s because my psychic demons tormented me to excess. “To be or not to be” wasn’t a philosophical question, but my confrontation with a logistical reality: will a plastic bag work, how deep does a razor have to go, are there legal poisons that kill fast and quick. Immediacy is important, because it’s the overwhelming pain that needs remedy, without worrying about extending one’s life a day longer than necessary. The “what if I tried and failed” propelled an alternative narrative rich in sensory detail and emotional projection, a part of my psyche warning me to think this thing through. Failure was not an option, so when it came to taking my life, the fear of failure proved a valuable ally in the will to survive’s beleaguered battle. When you’re in the throes of depression’s debilitating darkness, nothing really matters but finding a way to rid the mind and body of that crippling stranglehold. Sometimes in a movie, there is a character who gets gangrene, and must cut off their own limb to save their life. Suicide is similar, only to cut one’s psyche from one’s self, the whole of life must go. Suicide seems unerringly logical, for the rotting, debilitating thing needs ridding. For those who have never lived in depression’s fathomless depths, selfishness has nothing to do with it. It’s the pain. Day in, and day out. There’s no escape. Day after day, a relentless beast that consumes everything you have and then demands more. When the pain goes on for years, it’s like living with the infectious invasion of a gangrenous limb: though you know that poisons are spreading through you, know that the prices you are paying are too high, you don’t know how to make the thing go away, other than cutting it off. The weeks — no, months of my life — that I spent researching possible ways that I might permanently rid myself of the pain, and not merely fantasize about living without it, are incalculable. Researching my death, with a kind of scholarly ambition, was at times a part-time hobby: the idea of living without the oppressor was itself a hope, a medication. But Rob’s failure was the story that kept me from slashing my wrists deeply enough, consuming poison, putting a plastic bag over my head, for I learned early that I needed to get it right, needed to infallibly carry out whatever method might relieve me of the unbearable torment that was my life, the existence that I lived in. I don’t know if the fear of failure is a good reason not to kill one’s self, but it’s the one I had for too many years. Manic-depression was the diagnosis. At my worst, I was on five medications, twelve pills a day. The doctors incrementally increased my Prozac dosage, until I reached the maximum dose of 80 milligrams, four 20 milligram capsules a day. It didn’t put a smile on my face, a bounce in my walk, or make me feel like life was worthwhile. Every few months involved a new medication, a different color to add to the assortment: meadow green, pale pink, baby blue, white, sunshine yellow. They discussed putting me on lithium, but I couldn’t take lithium, because, I believe it was the blue pill, and lithium were potentially dangerous when taken together. There was a quasi-lithium medication, a salt related to lithium that they thought would act like lithium, while taking the blue bill. Or that’s how I remember it. The blue pill was important for some reason. I had been on it for some time. It took time to reach therapeutic levels. It required a managed, protracted withdrawal. They wanted to keep me on it. Instead, they would start me on lithium’s blue-pill friendly cousin. This pill, they assured me, would do the trick, and I could stay on the needed blue pill. There was a story for every pill, and none of the stories translated into psychic relief. I don’t know how long the insanity to cure the craziness went on. Those days are lost in chemical soup. Eventually, I felt absolutely nothing. I was as dead inside as Rob had been in that bed, alive but not living. I barely functioned, struggled to complete life’s basic tasks, take a shower, brush my teeth, do the dishes. I usually had the groceries delivered. Shopping, some people’s medication of choice, overwhelmed me when things were especially bleak. One day, I went to my apartment balcony, picked up my cat, held him, and looked out the balcony doors. Bleu was the new player in the unconscious will to survive. I doubted that anyone could cherish him as did I. I found him, because the clerk at out-patient psychiatry was talking about his Persian cat who was pregnant. I overheard him, and I told him that I would like one of the kittens. He agreed, and Bleu became mine before he was born. The horrors of the Rob narrative had weakened, from too many years of recycling, and too many years of psychic torment. Bleu was real, and he brought a new story into my life, because I wouldn’t leave him. My care of this little creature, despite my personal pain, affirmed something deep about me, and life. I replaced the picture of failure, the image thwarting my darkest demons from having their way, with hope, although I didn’t know it until writing this essay. This was the truth waiting to get out in this writing: I began a long process of psychic healing, when I replaced the image of failure with love. This was a deep shift, a meaning that I hadn’t comprehended until this moment. Caring for myself was onerous, but my invariable morning ritual was cleaning Bleu’s box, changing his water, and feeding him, the first thing every morning. In these simple daily acts, I touched something beyond the pain, however briefly. As I held Bleu and looked outside the balcony doors, stroking him and listening to his soft motor, I told myself, “I am going to live, or I am going to die, but I am not living like this anymore.” I then did what every psychiatrist tells their patients not to do, and I got rid of my medications. I didn’t simply quit taking them — I flushed one bottle after the other down the toilet, hundreds of dollars of meds, flushed. I’m not suggesting psychiatric patients dump their meds. A friend recently pointed out that it’s miraculous that I didn’t die within days, from the physical shock of withdrawal. This never occurred to me. I simply knew that if I were going to live, I refused to live as a member of the walking dead. I don’t know how long I had been on meds, I think several years by this time. Presumably, one doesn’t quit taking potent psychiatric drugs, for as long as I took them, without supervision. So they say. My inner voice, a voice that is perhaps documented somewhere as “hears voices,” called me to life. The sound was the faintest whisper in my soul, but I listened. I’m certain that a professional would scold me for being careless, for implying that seriously ill patients get a kitten, go off meds, and find happiness. I am not. Everyone differs. For me, because this is my story, my life, and my truth, I write that this was a powerful day, one that stays in my memory as pivotal, on an unconscious level, a really important seed planted itself in my soul. I gave myself a choice, to live or die. I chose to live, and somewhere, somehow, the message took hold. There’s no immediate happy ending to this story. I didn’t suddenly see the light, do the happy dance, and then go live in sunshine and flowers. The pain didn’t stop, nor did the suicide ideation disappear overnight. The road has been long, hard, and full of major setbacks. Including the Thanksgiving day that a too young Bleu unexpectedly died, and the crippling months following his death. I didn’t think that I would survive. But I did. Because that day that I looked out of my balcony doors, held a sweet creature in my arms, and dumped my meds, I affirmed life as a reality worth living, and that I was willing to work for, despite myself. Because this is my story, it’s my truth, as I know it today. If you’ve never struggled with depression, my great insight, that life is worth living and working for, is obvious, and my epiphany may sound obtuse in the extreme. For those of us with a skewed emotional lens, it is not. That’s the disease. The Buddhists, positive psychologists, and William James talk about habits of mind. Meditation. Awareness. Finding the good in every situation. Saying affirmations. Writing affirmations. Finding a truth that resonates with goodness, hope, love, and our most generous human sentiments. Culling for the good in every situation and every person. Appreciating nature. Focusing on life’s abundance. “There is no way to happiness, happiness is the way” may sound like tripe to those who haven’t been to hell and back on a nonstop loop from which there seems no end. But for those of us who have, it is perhaps the most precious gift that life offers, to simply be, and from that, to be happy, a little at a time. Building on being, day by day, working on self-love, fostering a loving, soul centered consciousness, that’s freedom and peace. Life does the rest. A little at a time. Day by day. I believe that I now live where I live, because of the work I’ve done for the past decade. Listening to the trees, the birds, seeing the seasons change, all of this life everywhere, I see and feel and hear, because I have known the other side more deeply than most. Life presented the opportunity to thrive, and I took it. There’s a synchronicity when you’re doing what you should, and listening better than before. There’s no simple explanation about how I got from point A to point B: the road has been a lot of trial and error. I have no answers. I also know that I have shortchanged an important topic, one fitting for a book, into a truncated essay with a cat and some platitudes for its ending. That’s not the point. The point is my personal progression from a grim and firsthand knowledge of debilitating psychic pain, to a life in which I appreciate life’s most simple gifts a little more, and feel their profound happiness, here and there, as life goes on. I call that thriving. My experiences seemed important to write on given last week’s headlines, not because I know someone else’s story, but because I wanted to share mine, however briefly. When I lived in Cambridge, I had seven large wooden bookcases, stuffed with books. Mostly philosophy, literature, mythology, poetry, and world religions. And art books. Oversized, gorgeous, collector’s editions. Some I picked up at museums — I had publications from American and European museums — and others I bought simply because I couldn’t resist their beauty. Some of my favorites were on the Uffizi, Van Gogh, The Louvre, Kandinsky, Leonardo. And Giotto. I loved the volume on Giotto, a magnificent publication that received glowing reviews, for it celebrated the father of the Italian Renaissance in remarkably accurate, color saturated reproductions. The oversized edition had sumptuous fold out plates, and detailed images in which you could see the master’s brush strokes, dabbles, accents, photographic close-ups whose beauty brought me to tears. When I left Cambridge, in the whirlwind of change and dissolution, I sold or gave away most of my books. I didn’t mind getting rid of my other stuff, but getting rid of the books was something I never imagined I would do. I remember crying to a friend in the middle of my bankruptcy, pending eviction, moving to the middle of nowhere chaos, “other women have children, and homes, and whatever it is that those women have. I have my books, they represent my life, and I have to get rid of them.” I was blathering as though I had been given a diagnosis of terminal cancer with only weeks left to live. My victim narrative was in overdrive, my books tethered to something that needed to be excised at the root level. I can’t tell you how much it pains me to write that, now. How transparently silly and self-indulgent I was being. But as I spoke those words to him, I started realizing that is why the books had to go. I was too heavily invested in an identity that wasn’t working, and I needed to let go so that I could dive into deeper creative waters. I also needed to embrace parts of myself that I had too long-buried, under work and study and self-loathing. I didn’t know it then. But I do, now. Getting rid of the books was transformative, because it meant letting go of one identity to embrace another, and I began understanding that all of this dissolution was the destruction before an inevitable creative resurrection. My choices, however radical they may seem on the surface, were an affirmation that I was willing to do what needed to be done to get to where I wanted to go. Which is what I have always done, with a kind of unflinching resolve when my back is against the wall. Ironically, where I wanted to go was exactly why I had all the books: I wanted a bold, creative, meaningful life, full of a spiritual, emotional, and intellectual richness. I was getting rid of the unnecessary to get the meaning that I sought. The books were central to my intellectual search for meaning. But I needed to shift my perception. I was beginning an exploration in which I crafted meaning from the inside out, not the outside in. For this reason, although I didn’t understand why, once I started getting rid of the books, they couldn’t go fast enough. I packed them up into suitcases, called a cab, loaded the cab with the suitcases, which I then hauled down to the basement of Harvard Bookstore, that is, their used book buying department. Sometimes someone offered to help me get them down the stairs. Sometimes I was on my own lugging a hundred pounds of books down to the basement. Trip after trip after trip, it took several trips a day for days to carry out the heroic task. I won’t say that it doesn’t still sometimes pain me to realize the tens of thousands of dollars of books that were swept from my life in a matter of days. Other women have children and homes and cars and whatever it is that they have. I had books. And I had an extraordinary library. As I went through my life’s exhaustive hoarding, I appreciated what great taste I had, the breadth and scope and intelligence that I managed to stuff into my collection. Some of civilization’s finest written works, lovingly sitting on my shelves, row by row by row. I also had a fairly extensive collection of Folio editions, beautifully bound and illustrated classics, that lined several shelves like the kings and queens of the collection. No used books on those shelves, just classics elegantly bound and sitting in embellished slip cases, looking grand and stately. It was a library that I would have coveted. I had made it mine. The art books were the last to go, sold to the book store just days before my move. While everything else in my life I let slip through my fingers with relative ease, the art books were precious, for they represented my life’s treasured adventures. They represented not just beauty for its own sake, but visits to some the world’s great museums, that I had managed to tuck into visits here and there. There was a gorgeous, red slip cased, double volume on Van Gogh that I shipped to myself from The Louvre. The complete catalog of Camille Claudel, bought at the Musée Rodin. Catalogs from exhibits that I made the time to visit, Kandinsky, Picasso, Brancusi. The search for meaning lay most conspicuously in the art books. Travel, adventure, beauty, spiritual longing, stored in two shelves of gorgeous books that circumstance dictate that I leave behind. It took three cab trips of several suitcases, but they were gone in one day. The several hundred dollars helped pay for my move. I don’t have room for books, now, though I have managed to collect a couple of stacks in the art supply littered living area. I ask for a lot of interlibrary loans from our small community library, and I sometimes access the New Hampshire public library’s online system of electronic content. Our library is right down the road from me. Out my front door, over the river’s bridge, down the road a couple of hundred feet. Our librarian is incredibly helpful, always making sure I get my idiosyncratic requests from larger libraries. She once even went to the trouble of borrowing from a New Hampshire university, though they were somewhat begrudging in filling the request. The pubic library here is funded mostly through community efforts. This weekend there were bake sales and book sales through the “Friends of the Library.” These events coincided with Old Home Week, a rural fair celebrating the old historical homes in this area. The weekend draws a lot of tourists — there’s a large craft fair held in the elementary school, the library has several events, and both our community store and our library generate a large chunk of their annual income from Old Home Week’s visitors. I normally don’t attend bake sales or community book sales. I rarely eat sweet baked goods, and I usually doubt that any of the books will be to my liking. But something told me to go to the book sale. I just knew to go. I walked down the street to the library, and on the front lawn stood a large white awning, covering the bake sale and rows and rows of boxes of books. Three smiling women volunteers greeted me. Most of the boxes were of contemporary best-selling fiction, which isn’t my interest. “Do you have anything that is pretty and colorful, maybe some photography books?” I asked, thinking of my art journals. I walked in, and at the top of the stairs were two boxes of books. On the top of one box was a book bearing Leonardo’s famous angel from “The Virgin Of The Rocks.” The angel got my attention, immediately. I started digging in the box, and there were old art history books. Varying degrees of quality, but lots of books with color plates. Color plates for art journals. I was ecstatic. A book on Giotto. A book on works in The National Gallery. A book on Leonardo. A large color book on the Uffizi. A beautiful small book on The Louvre collections. “Hey, are these for sale,” I asked. I dove in with abandon, “Oh my goddessess,” I sang outloud. Book after book contained plates that could be used in my art journals, a luxury I never would have allowed myself with my other art books, but here they were sitting and waiting for me at the top of the stairs. Waiting for me, in this box, not even shelved with the other book sale books. Art for my creativity. Not art to sit on a shelf, but images I could use to develop my own voice, my own creativity. Two large stacks of exploitable art books made their way into my grateful arms, for twenty dollars. I awoke last night drafting this essay in my sleep, going in and out of dreams, remembering my life as it was less than two years ago. For it was about this time in 2012, that I was hauling books to Harvard Book Store, selling my futon and bookcases, giving away porch loads of stuff to The Salvation Army, having no clue about where my life was going. Leaping into the unknown, yet again, with a vague idea of becoming a writer, as though it wasn’t something I didn’t already do, all of the time. I thought of my beloved art books, and my treasured library. I will have a library again, larger and even more voluptuous in its excesses, I believe. But now is not that time. Now is the time for embracing my voice, with clarity and conviction, and writing about why it was important to abandon other people’s ideas to craft my own. Perhaps most important, I know with certainty, not the certainty that blinds you, but the knowing that’s been earned from living one extraordinary experience after another, and learning to listen a little better to that inner voice, that there’s always another side to our darkest days, if we let life slip easily through our fingers. We can get better at it. We may never arrive, but a life well lived means letting life flow through you, instead of reaching for it over and over, grabbing onto something as permanent, then getting upset when it slips through your fingers, as all of life does. “Other women have . . .” such a powerful reflection of where I was and who I thought myself to be. Yes, I have. And no, I haven’t. I have made disastrous decisions, mucked things up big time in so many ways that I’ve lost count. But that’s not the point. It’s always what you do with yet another inchoate draft, a seemingly irredeemable art journal page, and a major bad decision that gets you closer to where you see yourself headed, if you’re willing to work a little more with it, and then give the mistakes over to imagination and grace. Over and over again. This is creativity’s essence: the vision to see through failure after failure, blunder after blunder, and let the beauty emerge. Creativity isn’t economical. Creativity’s full of thousands of pages of wasted words, journal pages decorated in expensive mediums and then covered up by gesso, in the need to start over again. Creativity’s full of excess, as Blake understood, an excess that is as necessary to our creative life as air and water are to our physical life. Formula only takes us so far. This is what religious dogma doesn’t understand, and where science fails when it demands unremitting skepticism. The artist’s adventure, and life’s adventure, is in breaking from the formulas into failure and perseverance. We may touch mystery in the process, learn more than we ever imagined possible for ourselves. This morning, I remembered my beloved Giotto art book on the bottom shelf in my living room in Cambridge. It was such an indulgence when I bought it, but I had to have it. The closeups, the thick black lines, the vibrant pinks and blues and greens, the brilliance and passion and tenderness with which Giotto painted. I then remembered my first visit to D. C., and my visit to The National Gallery. I turned the corner, and there was my first Giotto. I didn’t know The National Gallery had a Giotto, but there it was, and I immediately knew it was a Giotto. There was no mistake, the way the infant grasped the Madonna’s hand, the unmistakable break from religious iconography into Renaissance humanism. I gasped, and almost cried. My first Giotto in person. One day, I will visit Italy, and see the Giotto Saint Francis cycle, I will view his works around the churches in the Italian countryside. But this morning is not that morning. This morning, I took a book on Giotto that I found in a box of old books that inexplicably failed to make it to the shelves for a community book sale, and I lovingly tore out details from one of his great frescoes. I glued the fragments on an art journal page that I’ve been working on, glued them over an extravagance of metallic blues and Caran d’Ache pigments and various lines that I created with a French curve set, obliterating some fine work, so I could cut up Giotto and make his work my work. I gilded the page’s edges, and then I gilded the fragments. I thought how fortunate I am to be living this life, creating this art journal page, listening to the birds, and seeing the sunlight bathe the room. I am the luckiest person that I know, to be able to document this experience in writing, an entry that could not be written had I not given up a life that was not worth hanging onto, while embracing the uncertainty of the one waiting. In giving up the Giotto on the shelf, I got the one I could use. It’s a good day, and I’ve come a long way. 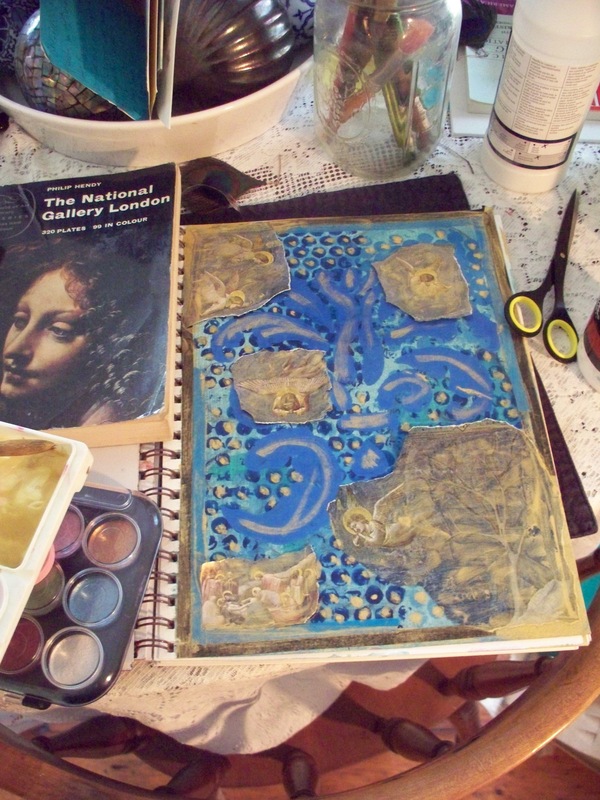 Journal page in progress, with cut outs from Giotto, and the Leonardo angel who lead me to the treasure box.